So tonight was my birthday dinner and all day my boyfriend kept asking me where I wanted to eat. Considering how much I love food and the occasion, this was a stressful and rather time-consuming process. I wanted to go somewhere delicious, but also somewhere that had a party atmosphere because as a group of 8, I knew that we would get loud. I decided on Serafina (the one located on Broadway at the bottom of the Dream hotel). There are a bunch of Serafinas in New York and I believe that this is the nicest one…some are actually rather grungy so go to this one or your experience may be completely different than the one my review prepares you for. The one on Broadway is very modern and chic, with glass chandeliers and artwork projected on the walls. The indoor dinning room is very large and there is also some outdoor seating too. The only place you don’t want be seated in this restaurant is in what I call “the red room”—a little space where the walls are covered in red light bulbs…it makes the person sitting across from you look like the devil. Also, the space is tight and there is tons of traffic moving behind you so its just bad…wait for another table. Anyways, onto the food!! Serafina is Italian and the food is pretty good…actually, very good considering it is kind of a New York chain restaurant. The best thing on the menu is the Focaccia De Sophia, and my boyfriend and I always get one to start (my birthday was no different…except that we ordered two!) 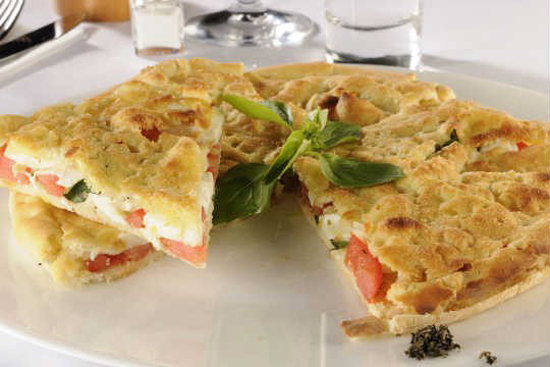 It is two very thin pieces of focaccia with a layer of melted goat cheese and truffle oil in the center. It is seriously dreamy! I love goat cheese and I love the flavor of truffles, so put them together with a carb and I’m in heaven! Everyone at the table went wild for it and all 16 pieces got finished. For my entrée I ordered the Penne Alla Stolichnaya (penne vodka with prosciutto), which is rich, creamy and delicious. It is topped with fresh basil and of course I always have them pile on the freshly grated Parmesan! On other occasions I have also had the I Taglionlini “Di Cortina,” which is a pasta dish with chicken, mushrooms, and peas in a light cream sauce—very good, but nothing special. I have also had the Chicken Salad “Gold Gym,” which has grilled chicken, sun dried tomatoes raisins, pine nuts, and pesto dressing. However, I substituted the raisins for goat cheese and mixed the pesto dressing with balsamic vinaigrette (which makes for a fabulous dressing that you can easily make at home with leftover pesto sauce!). The one thing I would not order again from Serafina (in fact I even sent it back) is the La Zuppa Della Nonna, which is their terrible version of a pasta fagioli. It has absolutely no flavor and is served in a bowl so shallow that it goes cold in .25 seconds. All the freshly grated Parmesan cheese in the world cannot even remedy this bland soup. Although the food is pretty good, the service at Serafina is not. The wait staff often forgets special requests for lemons, extra olive oil, ect…and they are usually very busy so you have to kind of grab at them to get their attention as they run by the table. My boyfriend, who is very particular about his whisky (he’s Venezuelan…enough said), always asks for his drink in a short glass. But EVERY time they bring it in a tall glass and he finds himself spilling his drink on the table as they later bring him a short glass to transfer the beverage. This time they really out did themselves and brought his whisky in a white wine glass…with drink straws, which was the greatest bartending fopaux I have ever seen! As far as drinks go, there is usual a problem but I play it safe with the Sangria, which is pretty delicious. Overall, this is a great place for large parties because the atmosphere is fun and chic and the price is reasonable for almost every budget (average entrée is $20). The menu isn’t very interesting or inventive but the food is simple and good, however, there are a lot of service problems that take away from the dining experience.